2 plants cultivated by members of ORCHIDS.ORG. 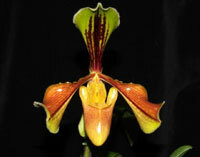 Paphiopedilum villosum is an orchid species identified by (Lindl.) Stein in 1892. ORIGIN: Found in Myanmar at elevations of 1070 to 1220 meters high up on limestone cliffs close to water seepage with the roots most often in mosses. DESCRIPTION: Cool growing terrestrial. This species blooms in the winter and spring on an erect, single flowered inflorescence. Said to be a synonym of P villosum but differs in having the dorsal sepal heavily spotted with purple as well as on the petals. -- information provided by Jay Pfahl, author of the Internet Orchid Species Encyclopedia (IOSPE).